Valentine's has come and gone and all my Cella's Chocolate Covered Cherries are gone. There are 3 of us in the house who love them. Thankfully I have a box of Two River's Coffee Cella's Chocolate Cherry Flavored K-Cup's to get me through until the next time we get to buy a bunch of chocolate. The coffee smells amazing. If you love Cella's Chocolate Covered Cherries you will love this. 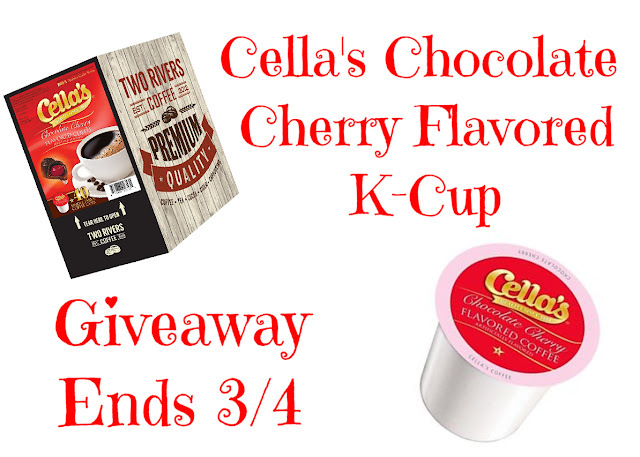 Cella's Chocolate Covered Cherry flavored coffee is made with 100% Arabica coffee beans and perfectly blended with Cella's Chocolate Covered Cherries. It is amazes me that they were able to re-create one of my favorite candies in drink form. HOW DO THEY DO THAT!? If you are looking for a treat for yourself, I highly suggest getting a box of Cella's coffee. There is no aftertaste. It tastes and smells amazing and doesn't have the calories that the candy has. That is a win-win. Oh wait, AND it is a great way to wake up in the morning. I brought a box for a friend for Valentine's Day because she gave up chocolate this year. She loves it and tells me it helps her with her chocolate craving AND tastes great the only problem is she is now drinking 4 cups of coffee a day instead of 1. Oh well...welcome to my world. To enter the Cella's Chocolate Covered Cherry Giveaway just leave a comment below telling me your favorite Valentine's candy before March 4th. My favorite kind of Valentine candy has to be Dark Chocolates! There's a local candy shop near us very reasonable. Dark chocolate is my fav. I love Fererro Rocher for Valentine's Day.